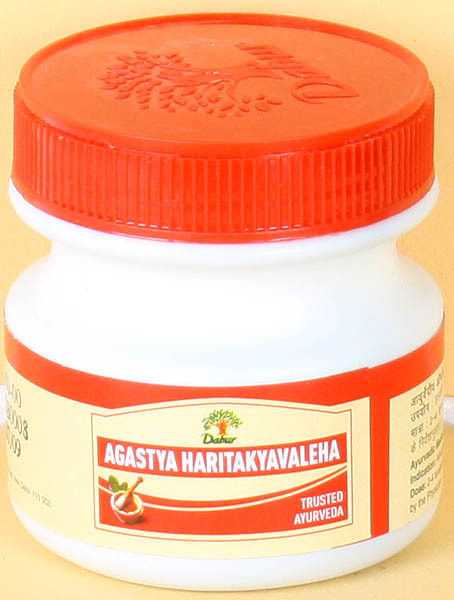 Haritaki 6.51 gm, Yava 40 gm, Shalparani, Prishniparni, Brihati, Kantakari, Gokshura, Bilva, Agnimantha, Shyonaka, Gambhari, Patala 0.625 gm each, Chitraka 12.5 gm, Pippali Mool, Apamarga, Shati, Atmagupta, Shankhapushpi, Bharangi, Gajapippali, Bala, pushkara 1.25 gm each, Goghrita, Til Tail 5 gm each, Guda 62.5 gm, Madhu, Pippali 2.5 gm each. Indications: Allergic respiratory conditions like Bronchitis and Asthma. Dosage: 12 to 24 g (2 to 4 tea spoonful) twice a day or as directed by the physician. Direction - With cold water or anise water. Avoid: Imli, Curd and Pulses.